Linguistische Berichte (LB) 228. 2011. 138 Seiten. In the field of ellipsis in coordination, the possibility to elide at the right edge of the first conjunct under (phonological) identity with material in the second conjunct can be regarded as communis opinio. 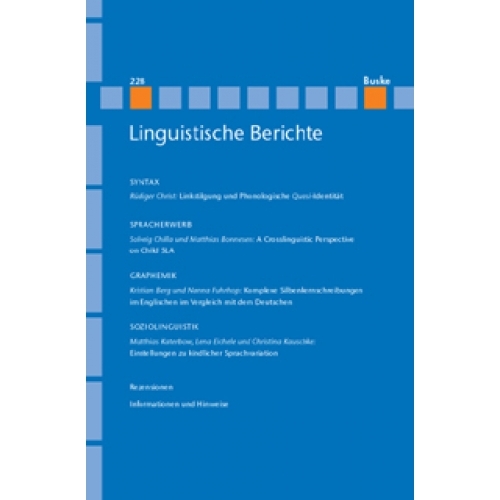 The main concern of this article is to show instead that this hypothesis is in need of refinement and has to be substituted by a gradual view: For Linkstilgung in German, the condition of Phonological Quasi-Identity applies. In addition to this, I want to identify a range of factors that need to be included, as not all grammatical features tolerate exceptions to strict phonological identity in the same way. Nevertheless, we have to remain sceptic about the identification of one single constraining factor: Neither the reference to phonology, nor to syntax or pragmatics alone can account for all cases of Linkstilgung and related phenomena. 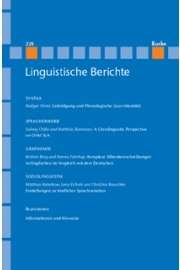 Focusing on the acquisition of questions in child second language acquisition (child SLA) German and French, this study investigates the matter of AO and sensitive period effects in the L2 acquisition of syntax and morphology. As such, it may shed light on cross-linguistic differences and similarities in children acquiring a second language in preschool. Two different groups of child second language learners are investigated, consisting of children with different typological language backgrounds (viz. Turkish and German) who learn typologically different second languages (viz. German and French, respectively). Our conclusion is threefold: (i) irrespective of the first language, child SLA is highly similar to first language acquisition (FLA) in the grammatical domain investigated; (ii) children with an age of onset of three to four form a heterogeneous group in terms of grammar development but may be considered simultaneous rather than successive bilinguals; and (iii) the input situation affects the interpretation of developmental patterns in child SLA. These aspects are discussed with reference to different claims about the characteristics of child SLA (i.e.Meisel 2008, 2009; Schwartz 2003a, b) and their consequences for linguistic modelling. Complex nuclei (e.g. ) can be explained rather straightforwardly in German, while English is considered more or less arbitrary in this respect. Based on the insight gained by research on German, the system behind this kind of cluster is described for English. The methods that are developed and employed will finally be applied to German, leading to new insights. Both writing systems have in common the existence of prototypical first and second parts and the great influence of the relative second parts on the correspondence of the diphthong. The English system shows more combinations than the German system, but it is by far not as random as generally assumed. Language acquisition has mostly been studied in terms of homogeneity instead of heterogeneity such as regional variation. On the other hand, developmental language disorders have been described in more detail. In this paper, we explore a combination of both types of variation – regional/social and developmental language disorders. We investigate the attitudes of adults toward children's regional variation and/or variation due to specific language impairment. The main findings are that language disorder is judged most negative with respect to achievement, social skills and parental education, while regional variation is judged much more positive. However, children with both regional variation and language impairment were judged less negative. The results suggest that regional variation may conceal language impairment for some degree.